NIHL is a complex disease that results from the interaction of occupational noise exposure, other risk factors like solvents, medication and vibration as well as life style factors (smoking and drinking status), and genetic risk factors [3, 4]. Noise exposure is associated with damage to the sensory cells of cochlea and the outer hair cells . Oxidative stress and synaptic excitotoxicity are the major mechanisms of morphological pathologies . However, under similar levels of noise exposure, workers may suffer different intensity of hearing damage. 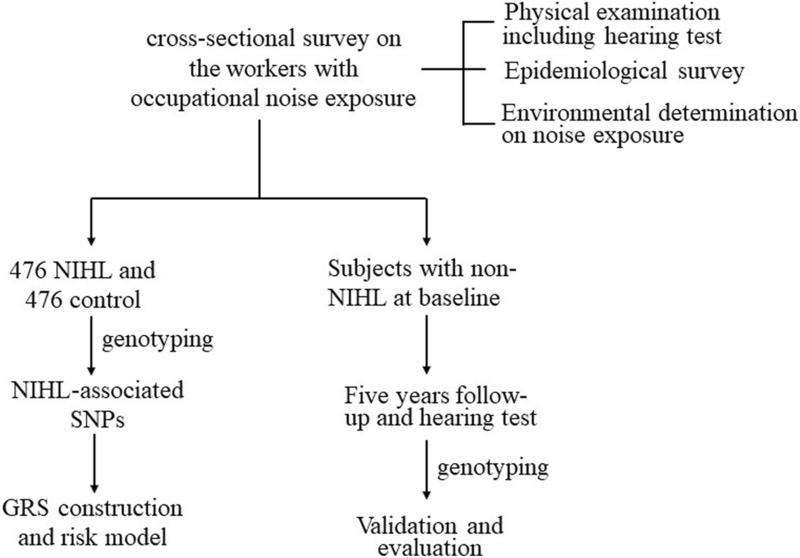 The differences indicate that genetic susceptibility plays an important role in the incidence of NIHL under noise-exposure environment. Previous animal and human studies have found that several genetic loci associated with the risk for NIHL . Genetic variations in the GSTM1, CAT, CDH23, KCNE1, heat shock protein 70, and 8-oxoG DNA glycosylase 1 genes have been found to be associated with NIHL risk [8–13]. However, the genetic mechanism of NIHL pathogenesis still remains unclear. Most previous studies have focused on a few candidate SNPs, and the sizes of the study population were generally small [12–14]. A total of 83 candidate SNPs in the 29 genes were selected as candidate SNPs in this study based on the HapMap database and previous reports [9–11, 15]. The inclusion criteria for searching for tag SNPs were as follows: minor allele frequency (MAF) in CHB > 0.05 and a linkage disequilibrium value of r2 > 0.8. The EYA4 gene is a member of the vertebrate EYA family of transcriptional activators, and we previously conducted an investigation on this gene and found that The SNPs of rs3777781 and rs212769 in the EYA4 gene were significantly associated with NIHL risk . Furthermore, rs212769 also validated in the prospective study. The subjects with genotypes AA increased the risk of incidence of NIHL. This finding indicate that EYA4 may play an important role in the incidence of NIHL. K+ is the main charge carrier of sound sensory conduction, and its normal circulation is important for the function of hearing. Previous studies have shown that sequence variants involving related genes may lead to hearing loss [1, 22–25]. Previous investigations on the associations between potassium circulation channel genes and NIHL have mainly focused on the GJB2, GJB3, GJB6, KCNE1, KCNQ1, and KCNQ4 genes, and some have been validated in various populations . KCNMA1 (BK channel), one of the potassium ion channel proteins, is expressed in the tubular system and renal vasculature, and mainly functions to control the transmembrane fluxes of K+ and Ca2+. However, KCNMA1 has been mainly studied in relation to tumorigenesis [26, 27]. In animal studies, mice lacking KCNMA1 can develop normal hearing at early life, but then later show progressive hearing loss, indicating that KCNMA1 is not essential for basic inner hair cell function [28, 29]. The potassium channels of KCNMA1 are apparently essential for the survival of outer hair cells, which are the major structural components of hearing [29, 30]. In this study, we found that the homozygote of mutant allele (CC) in rs696211 of KCNMA1 gene decreased and genotypes CC in rs7910544 increased the risk of NIHL. Therefore, the genetic variation of KCNMA1 modifies the risk of NIHL.